Want updates and free exclusive fiction? Click below for sneak peeks, free short stories, and updates! Welcome to the webpage for A. E. Lowan, author of The Books of Binding. Our series is a dark urban fantasy centered around the fictional city of Seahaven, Washington. At its core, it is a multi-generational saga about the importance of found families, our duties to one another, and the effect that a small, dedicated group can have on the world. Along the way we will meet heroes, villains, and many characters that fall somewhere in between. Our stories encompass love, loss, joy, regret, humor, horror, the fantastical, the mundane, the best and the worst that people – whatever their degree of humanity – have to offer. This site, like The Books of Binding themselves, will be growing over time. We invite you to come back often to see what is new in our world. We frequently publish flash fiction and articles about writing here. If you’d like access to free longer glimpses into our world, click on the subscribe button near the top of any page. The Books of Binding have been a labor of love for years and we are excited to share this world with you all, at last. Welcome to Seahaven. We are putting the finishing touches on our next full-length novel, Ties of Blood and Bone: The Second Book of Binding. It will be out in 2018. 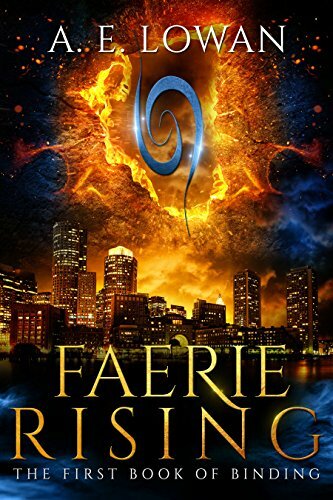 We are also excited to be offering print and audio versions of both Faerie Rising and Ties of Blood and Bone soon. Winter Mulcahy is the last wizard in the city of Seahaven, WA and all that stands between the fractious preternatural population and total chaos. Holding the city together by the skin of her teeth, the blood of her friends, and an addiction to stimulants that is slowly killing her, the young wizard is approached by a pair of sidhe lords who claim that her city is harboring a fugitive who has kidnapped a sidhe prince, and that they are on a mission to rescue the boy. Winter must investigate this fugitive to get to the truth of the kidnapping, discover the cause of the surges of wild magic tearing open rifts between realms across her city, and navigate the deadly waters of preternatural politics before Seahaven both figuratively and literally rips itself apart. Winter Mulcahy’s life is getting better since her brush with death in October. She has a new family and they are helping her to grieve and rebuild her shattered life. She is learning to balance family, medicine, and holding the chaos of living among the preternaturals of Seahaven at bay. She meets a wizard, Alerich Ashimar, with the soul of a poet and the heart of a demon who is desperate to escape the life and choices that have been forced onto him. This man may hold the secret to the tragedies that have plagued House Mulcahy, but time is running out—for them both. Alerich’s family is bound to a demon in a powerful geas set by his grandmother. Kill every Mulcahy by the upcoming winter solstice and her dead husband will be returned to her. Fail, and Alerich’s father, Magnus, will be forfeited to the demon. Magnus sends Alerich to collect Winter, the last of the Mulcahys, and bring her to the demon’s gate before the rapidly approaching deadline passes. Alerich is horribly conflicted. He has been trying to mend his estranged relationship with his father, and he doesn’t want his father to die. But nor does he want to kill this beautiful, kind woman upon whom so many depend. When Alerich does not bring the girl at the appointed time, his father, feeling that Alerich has abandoned and betrayed him, strikes a terrible deal with the demon—something the demon has always wanted in exchange for the power to kill this last Mulcahy and his traitorous son. Copyright © 2019 A. E. Lowan. All Rights Reserved.